St Paul's Church. It's History. THE PARISH CHURCH OF ST. PAUL'S, SHURDINGTON. the Campaign for Christian Stewardship. There has been a church at Shurdington for at least 800 years, for that is the age of the little Norman north doorway. It must have been re-used and moved to its present position, in the l4th Century, when the church was largely re-built. 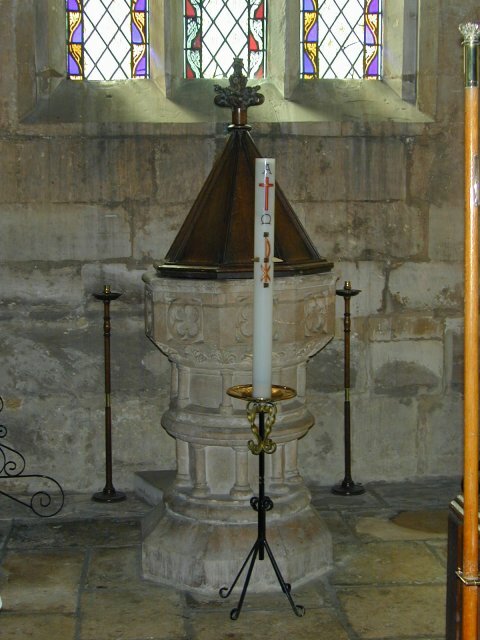 The only other features to be retained were the Chancel arch and the font, both of which date from the 11th Century. From the re-building, we have most of the church as we see it today; the outside walls with the small two-light windows, pillars and arches between the nave and North-Aisle, and also the tower and spire. The spire is unusually slender, and is considered one of the finest in the County. Also of this period are the timber roofs, with their interesting carved beads and bosses, some of which still show their original paintwork. The l5th Century parishioners added further beauty to the church, by inserting the larger windows at either end of the North Aisle and under the tower. In l635 Richard Gwinneth gave the sundial on the South Wall, and in the time of George III the Royal Coat of Arms was set up in the church. The church was restored in 1862, when the porch and vestry were added, and the interior furnished with oak box-pews and a new pulpit. In 1896, the spire was struck by lightning and had to be re-built; the date was carved on it, beside those of earlier restorations. This century (the 20th) has seen the gifts of the lectern, two stained glass windows, the organ, and new communion plate and Churchwardens wands. It has also been re-tiled and treated for beetle infection. Other writers have been impressed by St. Paul's spire. Arthur Mee in The Kings England (Published by Hodder and Stoughton in 1938) waxes lyrically about the "...amazing broached spire, 14 century, but restored." Without doubt, this is the most striking feature of the building. Beautifully proportioned, the broach soars to a height of 109 feet, gracile and slender. Various dates are carved into the stonework, recording some of the occasions when restoration work has been necessary. Attention was required in 1797, then again in 1894 when the spire was struck by lightning and had to be all-but rebuilt at a cost of £400. More restoration work was needed in 1945 and 1976. In the early 1980s the spire was again struck by lightning. For some reason - vandalism, or thoughtlessness - the conductor had been wrenched from the ground. Consequently the huge bolt of voltage surged down the copper line and jumped to earth with such ferocity that two stones from the base of the tower were pushed out of true. It was as though a giant hand had given them a shove in a fit of pique. Nearby St. Peter's at Leckhampton also boasts a fine broach, though not as perfect in form as St. Paul's. According to a probably apocryphal local folk tale, the builder of St. Peter's spire - unable to equal the masterpiece of his competitor at St. Paul's - took his own life. The roof has been re-tiled in the present century, though the basic construction of Cotswold slate roofs has remained unchanged for centuries. Limestone is porous. Consequently a roof made from this material must be steeply pitched to ensure water runs off quickly. You'll notice that the slates are not of a uniform size. At the apex they are small, graduating ever larger as they descend. Each of these slate sizes has a name - and the names vary from one locality to the next. Terms once in common currency, however, included duchesses, countesses, short wivetts, movedays and batchelors. The doorway on the north side of the building is something of a mystery. This is described as authentically Norman (i.e. 900 years old) by some sources, while others insist it was added in the 19th century. The latter seems more likely. The wall in which it is positioned is not part of the original Norman church, so if the doorway is authentic it must have been taken from another part of the building, or elsewhere and re-assembled. Quite apart from that, the rounded arch - though typically Norman in style - looks far too new. In medieval times the door on the north side of a church was known as the Devils Door. It was believed that evil spirits lurked to the sunless side of the church and this exit was only used by pallbearers leaving a funeral service carrying a coffin. Later on, it was common to inter dissenters on the north side of the church. Along the south wall from the 19th century porch is a sundial, which incidentally keeps accurate Greenwich Mean Time. It bears the inscription "16 Rich - Gwinneth 55". The Gwinnet family - who were wealthy Gloucester merchants - acquired nearby Badgeworth Manor during the reign of Queen Elizabeth 1 (1558-1603). In 1870 a flat stone memorial was removed from the nave. It read: "Here lyeth the body of Elizabeth Gwinnet, the wife of Laurence Gwinnet and daughter of Nicholas Blount Whiten, Gent, who departed this life 28 April 1655". Another member of the family, Gloucestershire born Button Gwinnet (1732-77), was one of three representatives of Georgia who signed the United States Declaration of Independence. The tiny chancel was remodelled an re-roofed in the 19th Century, when the vestry was added. Look up and see eight carved angels - corbels - which help support the weight above. Behind the altar is a seven panelled, stone reredos. Richly carved with angels, roses, lilies, wheat sheaves and vines, this 19th century screen came to Shurdington from St. Philip and St. James' in Cheltenham in about 1880. Between 1879 and 1882 the Cheltenham church was greatly enlarged and the alterations included the delivery of a new reredos made by H.H. Martyn. Above the altar, the east window depicts the Epiphany, while the window nearest the pulpit shows the conversion of St. Paul, the apostle of the Gentile church. The pointed Chancel Arch dates from the 13th century, but rests on earlier Norman stonework. Touching its apex is the ancient oak Rood Beam, which once supported a crucifix, flanked either side by statues of Mary and John. The crucifix was removed during the reign of Edward VI (1537-53), King of England and Ireland when Protestantism was established. It was probably by edict of Parliament in 1642 that the likenesses of Mary and John disappeared. With good eye-sight and a little imagination you may be able to discern the wall painting that occupies the semi-circular wall space above the Rood Beam. In 1987 this was examined in detail by an authority on the subject - Anna Hulbert of Oxford. It seems likely that the painting was intended to offset the bareness of wall when the rood was removed. Alternatively, the painting may have been commissioned to provide a backdrop for a new rood instilled in the reign of Mary Tudor. This dates the wall painting between 1537 and 1558. earlier chancel arch wall paintings in other churches often took as their subject the final judgement - a visual reminder to medieval congregations that demons, fire and perpetual torture were the wages of wickedness. St. Paul's 16th Century painting was, however, less dramatic in execution. Take a look at the framed representation to the side of the chancel arch and you'll glimpse a fragment of what churchgoers saw 450 years ago when the paint was fresh and vibrant. Stylised pomegranates, fruits and flowers feature in this Italinate pattern. the design was popular in its day and appeared on silk, velvet, brocades and other fabrics imported into Britain during the 15th and 16th Centuries. Two shades of yellow ochre, red ochre and white outlines were employed in the repeated pattern. Prior to the Reformation, church interior, were commonly colourful. During his restoration in the mid-1980s, traces of red and green paint were noted around the nostrils and teeth of the Green Man. Carved into the oak beam that spans the nave, this grinning pagan character, with his beard of leaves reminds us that the church sometimes embraced pre Christian symbols, as it did festivals. The Green Man is a mythical figure who features in ancient literature and lore in various versions all over the world. He's a personification of Nature, a fertility symbol and - in medieval minds - a force both benevolent and to be feared. An avenue of yews lines the churchyard path. Often found around ancient churches, yew trees were planted for practical and spiritual purposes. Slow growing, evergreen and long living, they serve as a symbol of immortality. They also supplemented the incumbent's income in an age when yew wood was much favoured by archers for the making of longbows. On the left side of the path that runs from churchyard gate to porch, a memorial tells a sad tale. Like a number of memorials in the churchyard, it is inscribed on copper. "In memory of Joseph Jordon Clark, died 12 October 1825, aged 13. We hope an angel in a brighter sphere. My father found me moaning, bleeding on the ground. My mother did bewail me, in the jaws of death. Within nine hours to God I did resign my breath. A sudden change may happen to us all. My lot's today, tomorrow thine may fall." War Memorial in the church.